A genuine WIne Country headquarters with the best of the Beamsville Bench vineyards right at your door. A classic red brick farmhouse with porches that look over our vineyards to Lake Ontario and beyond to the skyline of Toronto. Niagara Escarpment Biosphere Reserve in your backyard with access to Bruce Trail. High quality furnishings with hardwood floors throughout including in a well provisioned, custom kitchen. Entirely accessible with elevator: a rarity! Four full bedrooms with generous closet space. Master bedrooms has an ensuite with shower/tub and the main bathroom has an accessible, dual shower head roll in shower. Television room is separate from the living room so some can watch while others chat. The upstairs den has a pullout and a wonderful balcony with loveseat and chair. For wine tourists, this lovely rural property is less than ten kilometers to Jordan Village, the headquarters of Cave Spring Cellars, and its shops, galleries and restaurants. 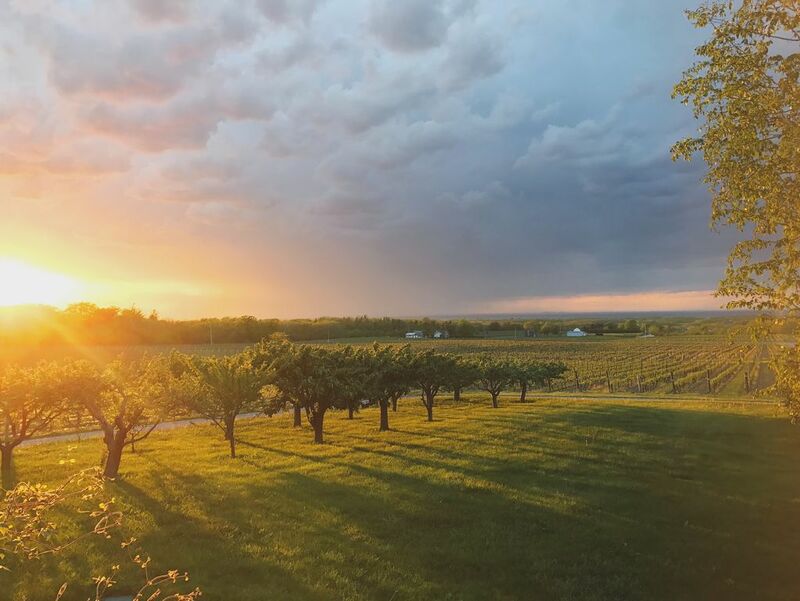 It is a similar distance to the Mountainview area of wineries such as Hidden Bench and Peninsula Ridge and the Cherry Avenue wineries such as Tawse and Vineland Estates. There are wineries such as Malivoire and Redstone that you can easily walk to! Culinary tourists are equally well served by the exciting winery restaurants in the Twenty Valley, such as Inn on the Twenty and the Good Earth Bistro. For theatre goers, the Shaw Festival is a leisurely half hour drive. And don't miss the Niagara Falls, the same half hour away. For international guests, the house is 99 kilometres from downtown Toronto and about 40 Kilometres to the US border and Buffalo: both cities are achievable day trips from the Estate House. We have lived on the estate for thirty years and will be your next door neighbours during your stay. We are also hospitality professionals who love travel ourselves. This is a family project with our adult children participating in making the house ready for guests. This house is the original farmhouse for the Cave Spring Estate. We have great photos of it in the forties and have enjoyed looking at it for the decades we have lived in the vineyard. It has a great view and allows guests to really feel like vintners. No need to go to Tuscany to stay in a vineyard! The views are wonderful both to the lake and onto the Escarpment....really any way you look. The porches and deck are very welcoming and an early morning coffee on either is a lovely start to the day. The house sits right next to Cave Spring Conservation Area which is part of the Biosphere Reserve. Spectral escarpment walks literally over the fence. Vineyards surround on the other two sides. Sitting halfway up the Niagara Escarpment, the house has a spectacular view of vineyards, Lake Ontario and the Toronto skyline. Adjacent to kitchen, dining room has cherry table and eight chairs; extension to add a couple more. Helen's house is a fabulous place for a family gathering. This is the second time we've stayed during the Christmas season, and it was perfect both times. Helen goes out of her way to make sure everything is taken care of before your arrival, the house has everything you need for your stay, the rooms are beautifully furnished and very comfortable, the view is stunning. If you are staying in this area, this is the place to be! Beautiful property in niagara wine country! Wonderful and relaxing property! All amenities taken care of and the house is beautifully situated in the middle of a gorgeous vineyard. Great for our girls weekend get away! Thanks Alicia! So glad you enjoyed your "escape"! Being surrounded by wineries always helps doesn't it? We spent five days and four nights with our adult children to attend a wedding nearby and were just wowed by how outstanding the property was. An incredibly beautiful house with everything you could possibly need available for your use, with amazing and multiple outdoor spaces and a view of the vineyards and Lake Ontario that could not be beat.We so appreciated meeting the owner Helen and her daughter, Giuliana, who were kind enough to give us a tour of their amazing vineyard and offer us a bottle of their outstanding wine as a welcome gift. Truly words cannot describe the comfort, beauty and charm of this home which just sparkled with cleanliness and attention to detail. We loved it and cannot wait to return, this time to spend time visiting the area and the many vineyards and towns. While we very much appreciate such a kind review, we must say that guests like these folk make our job as hosts easy! Engaged and engaging people. We certainly hope they return so we can continue their education in Ontario wines (though we suspect they could teach us a great deal about other regions’ wines too!). Our pleasure entirely! Everything contributed to a wonderful week for 8 people spanning 3 generations plus a dog to share the Christmas holiday. The home is very comfortably furnished and the property is expansive as well. The pictures presented are pretty accurate - we were in a vineyard with the rustic trails of the escarpment behind and in front the rolling land down to Lake Ontario and Toronto beyond. We did go to Niagara Falls and that was worth it, but the majority of our time was happily spent on the property. It suited those of us who wanted simply to relax as well as others who wanted more to do. We met both Helen and Len, both friendly and gracious. A special thanks to them for over the top courtesy. We would highly recommend a stay here. We would have stayed longer if we could. Thanks! You make hosting easy! We hope you can make it back when there are grapes to show for our efforts. The Vineyard Estate House in Niagara was AWESOME!!! As we live in BC, we used the Vineyard Estate House as a home-base for our daughter's wedding in St. Catherines. The interior was comfortably and tastefully furnished with modern furniture, and it had lots of plates, bowls, serving dishes and cutlery. The beds were comfy!! The whole property was well maintained. We loved being in the middle of a working vineyard. And, last but not least, the views were spectacular!!! Thanks for letting us stay! Thanks Marilyn for choosing us for such an important family event. Lincoln is 30 minutes from Niagara Falls and so perfect for a trip to see this iconic attraction. However it is a world away in terms of relaxation: definitely go see the Falls but relax in the rural quiet of the vineyard! The Beamsville Bench winery area is one of the most prestigious in Canada. There are over 40 wineries in the neighbourhood along with their stylishly casual restaurants. We are very close the major arterial highways of the Niagara corridor to the US so accessibility is not a problem at all: you are just ten minutes away. Jordan Village is where Cave Spring makes its wine and it is its vineyards over which the Estate House looks...in fact is was the historical estate house of the farm. The village also has great boutiques, galleries and a nice, spoiling spa. Half hour proximity to St Catharines, NIagara on the Lake and Niagara Falls means busier venues are at hand, whether for theatre goers or folks looking for classic tourism blockbuster activity. But many come to this end of the peninsula for the fine rural feeling and the chance to unwind. Biking is a particular pleasure in this part of the peninsula with lots of scenic roads intermingled with modest hills. We only allow those who are registered by the renter to be on site; if this proviso is ignored, the group will be asked to vacate immediately without refund. We cannot stress too strongly that this property cannot be used as a party or wedding venue. We have a fully private apartment on site and expect reasonable quiet after 11:00. We will ask for passport or government ID upon check in: as noted the person responsible for the reservation must be over 25 years old. Holiday weekends, Easter and Christmas attract summer rates and minimum stays even though they may be in low season.